This incense burner is an 11″ Dragon Wizard Coffin. Made of 100% Polyresin. It is metallic black and decorated with a chained dragon and wizard across the lid. Can be used laying down, or standing upright. 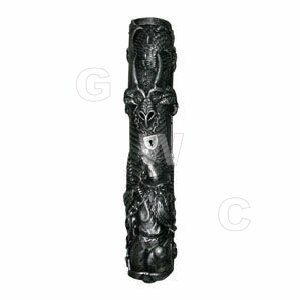 The Dragon Wizard Coffin Incense Burner is a great gift to give. Purchase one now from our store or take a look around for any others you might like!!! Thank You!! !